In the account of life in the first Christian congregation in the Acts of the Apostles Ch.2 v 42 we read about certain things that were basic to the life of the Church then and still are today: worship, learning, prayer, sharing in the Lord's Supper and caring for one another. This is still the true pattern of congregational life in the Church and when this life is shared, then the work and witness of the Church flourish. All of these things are catered for in Sunday morning worship and our programme of Christian education, fellowship and prayer. All members of the congregation are encouraged to share in the life of the Church through their giving. The stewardship of the Church's income is directed by the Congregational Board under the guidance of the Finance Committee. Our Congregational Treasurer is Alan Sinclair. 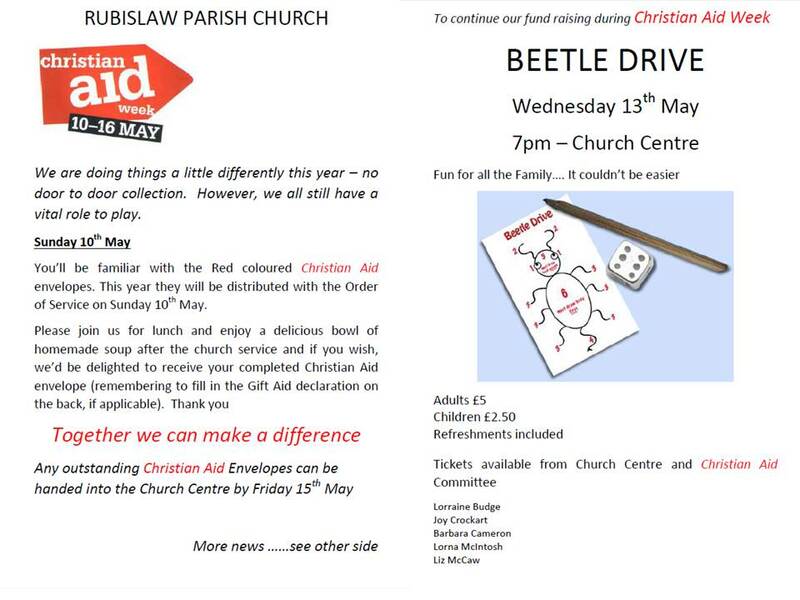 Church Giving at Rubislaw Church is reviewed annually and all members are invited to attend the Annual Business Meeting of Church and Centre in church on Sunday 30 March 2014. Flowers are placed in the Church every week. After the services they are taken to the sick, housebound or bereaved to tell them of the love and prayers of the Church. Every member is given the opportunity to place flowers in Church. The Flower List is on the wall in the vestibule at the side door of the church, and Olive would greatly appreciate if more members would sign up from September onwards to do flowers on a date chosen by themselves. There is also a FLOWER FUND for those who wish to make a donation towards the cost of a day's flowers. Donations to Church Centre office. “I would like someone to live after my death” - cards are available from the Centre office. Rubislaw Church supports Fairtrade by running a stall and selling Traidcraft food and snacks. The stall is available in the Church Centre after worship on the last Sunday of each month.